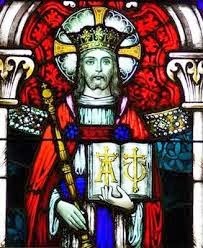 The feast of Christ the King was instituted in the middle ages when kings and queens were the common form of rule in Europe. It is the feast which ends the Christian calendar. It seemed fitting to end the year with recognition of Christ’s rule and reign over all creation and over all our lives. But what kind of king is Christ? First, we need to recognize that kingship was central to Christ’s mission. Matthew, Mark, and Luke speak with one voice in telling us that at the very beginning of his ministry, Jesus announced that the “kingdom of God” was drawing near. A kingdom implies a ruler and realm. Then at the end of his life, the Gospels record an inscription on the cross, ‘This is the King of the Jews’. But Jesus upended and undermined the whole concept of kingship. This world’s kingdoms are about power and prestige; Jesus was about service and humility. The rulers of this world are about coercion and violence; Jesus’ life was characterized by peace and reconciliation. Kings surround themselves with subservient aristocratic courts, servants and subjects. Jesus chose the lowly, the poor, and the unclean as his companions. Secondly, we see what kind of king Jesus is by the sayings of Jesus from the cross. One of the powers of kings is to pardon those accused of crimes. The irony of the crucifixion is that Jesus was sentenced to die for claiming to be a king. However, even while being nailed to the cross, Jesus demonstrated that it was his executioners who were in need of pardon and he alone had the power to grant it. “Father, forgive them for they do not know what they are doing.” In pardoning those who were executing him, Jesus showed us the power of forgiveness. Forgiveness frees not only those who are forgiven; it also frees the forgiver. When we forgive, we release ourselves from the chains of anger and resentment. In another saying, Jesus speaks to the penitent thief and promises him that he will be with Jesus in Paradise. Kings and rulers are usually surrounded by throngs of groupies or hanger-on-ers. One thinks of Louis the Fourteenth’s palace at Versailles, deliberately built to keep France’s nobles occupied in an endless round of meaningless ceremonies so that they would have no time to plot against the king. In contrast, Jesus surrounded himself with the outcasts and the marginalized. He crossed social, moral, and religious boundaries by accepting women as disciples. He went against religious regulation and touched the lepers. His critics charged that he ate and drank with sinners, thieves and prostitutes. One Bishop remarked that Jesus does the same thing every time we celebrate the Eucharist! Poignantly, the penitent thief pleaded, “Jesus, remember me when you come into your kingdom.” Jesus replied, ‘Today you will be with me in Paradise’. “Remembrance” is central to Jewish thought. When the Israelites were slaves in Egypt, Exodus tells us that God “remembered” the covenant he had made with the patriarchs. The kind of remembering that God did in Exodus and that the thief was asking Jesus to do is not the opposite of forgetting; it is the opposite of dismissing or excluding. The thief was asking to be included, to be made a part of Jesus’ kingdom. The Crucified and Risen Christ remembers not only us but also the forgotten, neglected and marginalized; he remembers us as we are – with strengths and weaknesses, the good and bad, successes and failures. “Lord Jesus, remember me when you come into your kingdom,” prayed the penitent thief; but it is our prayer, too. Indeed, it may be the one of the most important prayers that we pray. Like the thief crucified beside Jesus, we pray that we may be a part of the great kingdom Christ is building in this world and the next. A third way we see what kind of kings Jesus is, is by the way he is enthroned. The way to Christ’s throne was not the royal enthronement of pomp and circumstance in a grand cathedral. His enthronement was the crucifixion, the cross. It was a shameful death, the death of one who was cursed. His shame was our glory. His curse was our redemption. There was no royal robe, but he was stripped in disgrace. There was no golden jewelled crown, but a crown of thorns. This is our king, the son of God who chooses to be born in manager, to live a simple life of a labourer. He came not be to be served but to serve and to give his life as a ransom. He came not to command, but to obey his heavenly father. He came not for fame and fortune, but to be rejected and despised by those in authority and power so that he might be our Lord and King. His rule is never imposed or forced. He comes in love to those who welcome him in simple faith. His judgment is only against those who trust in their own righteousness and who live only for themselves; against those who chose evil and wickedness to oppress and harm others. From the cross, God exalted Jesus to his right hand on high where he does not rule with force, but with love and patience, calling you and me into his outstretched arms. Jesus is Christ the King. He is a king like no other. His kingdom is our hearts; his followers, the needy and despised, sinners like you and me. He rules with forgiveness. No one who comes to him in humility is rejected. His throne is a cross. He invites you and me to turn to him in faith and to let him be Lord of Lord and King of Kings in our heart and lives, in our homes and in our churches. Our Parish Mission Statement says that we are “Connecting with God’s love in new and imaginative ways”. For many, using the internet and social media as an everyday tool isn’t at all strange, but for some it will be a whole new aspect to church life. We hope that by embracing technology and social media, we will be able to reach out to others not currently in our Parish community, but also to give you a new way of interacting with Parish life, and showing the world what we do. We have a new Twitter account, Facebook page, Pinterest boards, Blog, and soon a re-launched website. They will all focus on the Parish with info on individual churches on the website, and hopefully other forms of media will be involved later. While much of the content will be generated by the clergy and readers, we want you to feel involved as well. Look here for more information and pictures, and let us know what you would like to see here. Here we will be pinning pictures of the churches, a display of the remarkable kneelers at St Nicholas (they’re all unique), children’s artwork…..and any other images reflecting God’s creation within our Parish Community. We would love your ideas and images. Please read the Blog: parishofharpenden.blogspot.co.uk (here - you've found it!). The Blog is a place to find the thoughts of not only the clergy and readers - but also a place to enter into discussion about what is posted. You will also find the Advent “Waiting” images across all the sites from December 1st. Please join us on our digital journey. We can’t do it without you. Let us know what YOU want to see there, and help us reach into the community in a new and imaginative way. It would be great if you could tell others where to find us as well. Equally if you or someone you know simply doesn't understand any of this but would like to, we hope to offer some "social media clinics" to help you figure it all out, and have a go at engaging with our new online community. Please let me know if you're interested in this. If you have any activity associated with the Parish you want featured please email me at digital.media@parishofharpenden.org. Please read the Blog: parishofharpenden.blogspot.co.uk (here – you’ve found it!). The Blog is a place to find the thoughts of not only the clergy and readers – but also a place to enter into discussion about what is posted. Equally if you or someone you know simply doesn’t understand any of this but would like to, we hope to offer some “social media clinics” to help you figure it all out, and have a go at engaging with our new online community. Please let me know if you’re interested in this. Parable of the Sower...What kind of soil are you? Sometimes we say people speak in riddles. By that we usually mean they are hard to understand in some way. Jesus spoke in riddles called parables. The reason he spoke in parables was to divide his listeners. Those who wanted to understand would seek the answers to understand what he was saying. Those who were not interested would not bother and just go their own way not caring about what Jesus was saying. We see that in the parable of the Sower. The disciples don’t understand but they ask Jesus what it means. The parable is about seed and whether it grows. The seed, we are told, is the word of the kingdom. It is the message of Jesus. Let’s think for a minute about how we hear the word of the kingdom. How it comes to us. First and foremost we hear the word proclaimed. This might be a sermon in church; it might be testimony shared by a friend; it might be a message at a small group like a bible study. People also hear the word of the kingdom by reading the bible or reading a book that tells the good news in some manner. There are magazines and newspapers that share the good news as well. If you are a person of faith, how do you engage with the word of the kingdom? Do you only hear it in church? Do you seek out the words of eternal life in your daily life, even if daily by reading the bible or using some form of devotional tools? Maybe you belong to a small group. Maybe you read some kind of Christian literature. The heart of the parable though is not so much how the seed gets to you or about the sower. It is about what happens when you hear the word of the kingdom and the soil. The parable discusses four different soils. First soil: seed falls on the path/birds eat it: explanation--evil one snatches it away because they do not understand. This is about the reality that some people hear the word of the kingdom, the good news, the gospel and it does not take root. They, out of indifference or defiance don’t let the seed take root in any way. It never becomes part of their life. The explanation relates it to understanding. If you are not interested and you are wholly content in your self-contained world, then you do not bother to understand. Faith requires that in some way the person chooses to engage with the word of the kingdom. To accept it enough to explore it and consider it and weigh it as an option. For many people their world view will not let them understand. They are not seeking or searching. Second soil: seed falls on rocky ground/not much soil/sun scorches: explanation--received it with joy immediately, when trouble and persecution comes they fall away. Other people are searching, curious, wanting to find the answers to the big questions of life. The seed immediately takes root in their life. But it does not take deep root. As soon as a question comes that they cannot answer or things get challenging, they move on and leave the word of the kingdom behind. A lot of people are spiritual vagabonds. They move from one spiritual idea to another. Whatever makes them feel good and gives a sense of self-fulfilment, that is what works for a time. The Christian faith is challenging. It is not about self-fulfilment (though that is part of it). It is ultimately about recognising God as Lord and God’s love given to us in Christ Jesus. For some, it is attractive but requires too much commitment. Third soil: seed falls among the thorns, thorns choke the plants: explanation--cares of the world and the lure of wealth choke the word and it yields nothing. This seed, this word of the kingdom actually takes root and grows. A person embarks seriously on the Christian path. But eventually, something comes and uproots and replaces the word of the kingdom. The cares of the world are not so much problems, but when something comes and takes priority. For some people that can be a relationship. They stop practising their faith because it gets in the way of a relationship with someone they are attracted to or in love with. It can be a job and career which takes hold of one’s life so that it consumes one’s time and energy and life so that there is no room for anything else. For others success or the desire for success and wealth become so important that the way of faith becomes a bother and a nuisance, a hindrance, a complication so that one abandons the Christian perspective. Fourth soil: sSeed falls on good soil and brings forth grain: hears the word and understands and bears fruit. Clearly the ideal is the person who receives the seed with joy and does what is necessary to let the seed grow to bear fruit. The key word is ‘understanding’. Remember what the word disciple means. It means learner. To embark on a life of faith means that one has faith that seeks understanding. One has faith that wants to understand more about who God is, how God acts, what a Christian should believe, how a Christian should live, how a Christian can serve others. The path of deep rooted faith means one engages with all that is there to help one grow in understanding; as our diocesan slogan says, to go deeper into God. In conclusion, this parable has two questions for us to consider. First, what kind of soil are we: a path where the seed cannot grow, rocky soil where the roots don’t go deep, thorny soil where the seed that grows is choked and dies or good soil? The second question is, if we are good soil, what do we do to ensure that we bear much fruit? What are we doing to nurture our faith so that it grows and deepens and bears fruit? The parable leaves you and me to go away and consider. Parable of the Sower…What kind of soil are you? First soil: seed falls on the path/birds eat it: explanation–evil one snatches it away because they do not understand. Second soil: seed falls on rocky ground/not much soil/sun scorches: explanation–received it with joy immediately, when trouble and persecution comes they fall away. Third soil: seed falls among the thorns, thorns choke the plants: explanation–cares of the world and the lure of wealth choke the word and it yields nothing.